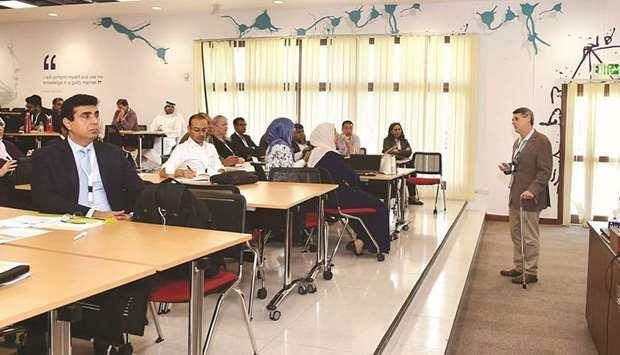 (MENAFN - Gulf Times) The Public Health Department at Qatar University's (QU) College of Health Sciences (CHS) yesterday started an intensive workshop on evidence-based clinical practice, which contributes to continuous professional development. The three-day event is attended by specialists in the field, especially from Primary Health Care Corp, Hamad General Hospital, Ministry of Public Health, Aspetar and Sidra Medicine, as well as specialists in the field of formulating clinical guidelines. Evidence-based clinical practice is a vital part of healthcare that uses high-quality clinical research in decision making and the provision of optimum patient healthcare. It requires updated doctor competencies, including methodological research skills and the application of formal rules of evidence in the evaluation of clinical data and results of this research. The workshop includes methodological lectures by Dr Gordon Guyatt, McMaster University, distinguished professor of Clinical Epidemiology and Biostatistics, who was the first to coin the term 'evidence based medicine and is considered among the movement's earliest and most prominent champions. In addition, the workshop includes opportunities for advanced skills under the supervision of a number of epidemiologists from QU's College of Health Sciences and College of Medicine. The workshop enhances skills in assessing systematic research and integrating values into clinical decision making. Such skills will enhance the accuracy and understanding of epidemiological concepts, thereby improving scientific research, ensuring quality for different healthcare interventions and providing better care for patients in Qatari society.